According to School Principals(1) in national news articles schools are facing a crisis where up to 30% of their students are under mental strain with anxiety, depression, fear of failure, bullying and ‘the need to be perfect’ taking a toll on learning. This STOPS efficient learning, it impacts grades, decreases motivation, damages emotional well-being and corrupts a students capacity to face change confidently in future employment transitions. How a student deals with school is how they tend to behave for the rest of their life. Education is the foundation of learning, behaviour and life path. During their school years a student sets their behaviour patterns into either self-driven (internal motivation) or peer driven (externally or socially influenced) ways of living. Is your daughter or son one of those 30%? Most schools currently don’t have the resources to address these issues thoroughly. Students and parents will have to solve this issue for themselves; but how? There are few resources to teach and encourage techniques that assist stress reduction and the philosophy of trying and failing as being healthy and needed for integrated learning. Schools (Australia and New Zealand at least) face rigorous compliance standards by bureaucratic government educational standards (eg: AQF in Australia). This forces ‘left brain only’ assessment methods and adds a massive administrative burden on any educational or training provider. Resources that could otherwise be used to grow competent students. It is up to schools to find extra funding to help this 30% of students under mental and emotional stress. 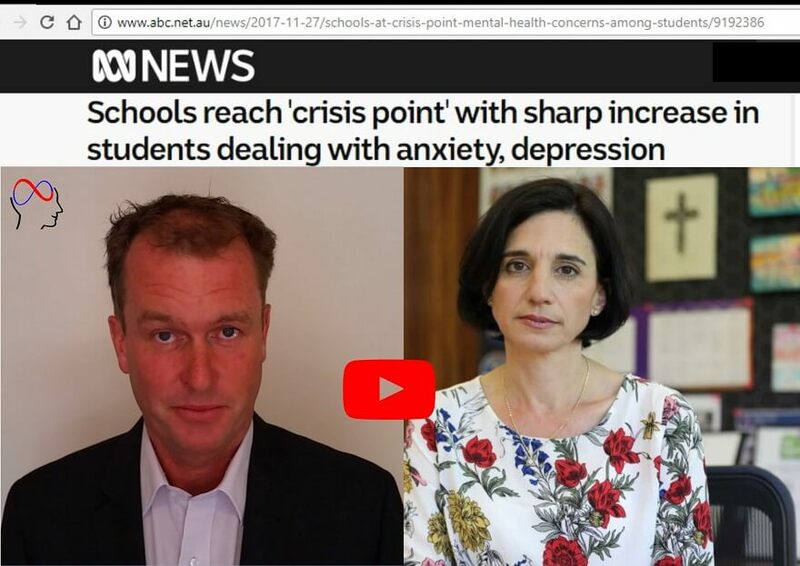 Schools are at a Crisis Point(1) as stated by Principals in ABC news articles. Issues that impact grades, motivation, stress, anxiety, depression and unwanted behaviours may be out of the education context. This includes medical, pre-existing personal conditions, family, friends and social media impacts. Some of these issues cannot be resolved by schools but the effects on behaviour and performance impact the school and classroom. In brief many of these issues can be resolved quite easily through knowing how to learn, motivate and State Change. State Changing in the context of education is moving from a distracted and unfocused state that is bad for study into a relaxed whole brain state that maximises learning and performance. Once these basic skill sets are mastered a student can use much more of their potential and feel good about themselves and their studies. When a student feels good because they are relaxed and achieving, its hard to be anxious or depressed about school. The core study skills module lays the necessary foundation for any person to study successfully. These skill sets can then be applied to other areas of at student’s life. To use a metaphor; once you learn to ride the bicycle of learning a subject, you can then win the race of achieving in life. The core skills set is already learned and being practised in study. The study skills I tutor involve a range of techniques that builds competency at all levels, mental, emotional, motivational and neurological. This mix of skills and abilities are mostly learned through following the the simple Student Success Tutor techniques. These deeper abilities are then learned without any effort. After the initial 8 session core skill set we focus and make the new unconscious skills that have been practised to be conscious. The student can then further enhance their memory, emotional intelligence and motivation to all areas of their life. In fact photographic memory is possible for most people if they are trained and skilled in the process. A stable study routine and determination (motivation and want) is required to train the mind to be photographic. An empowered learner can self teach, self monitor and self-motivate so they can change what they don’t like. The fundamental skill of noticing if one is in the Learning State lays a concrete foundation of applying the same principles to all life. My mission and goal of tutoring is to take students to this empowered place, to spark that joy of learning that applies to all life circumstance. Naturally some of life’s issues are more complex and deeply embedded in the psychology of the individual. These issues will require time to shift with appropriate guidance and tutoring. My observations will be given to the student directly for them to think about and respond to. Recommendations will be made to parents in the parent feedback calls. Its important to co-ordinate and make a pathway to success happen. Basic ‘educationally related’ exam stress, study & exam anxiety decrease quickly. Students are taught via multiple approaches to enter the Learning State. This puts the student into a whole-brain learning state. Then it’s easy, fast, efficient for the information to go in, be processed, good answers to be formulated and finally to get the information for assessments or exams. The Student Success Tutoring process creates accountability, feedback and positive motivation influences so the study routine to be formed and actioned. This will increase grades, motivation and improve the students behaviour as they are happier with themselves. ✔ Does your daughter or son know how to study properly? ✔ Do they have a study routine? ✔ Do they actually get the study done? ✔ Do they make the most of class time, which cuts back on home study? ✔ Do they know how to self motivate and chase what they want? ✔ Do they know how to shrug off stress and relationship tensions? Bullying was also mentioned in the article(1). As that is tough topic and outside the educational context there is a separate page and video on that. Make contact if you want to make positive improvements in your son or daughters studies and experience of school life. Individual online tutoring is limited to 16 students total worldwide. Book here. First calls / video session to assess outcomes is free. Wait list may apply. Schools reach crisis point with a sharp increase in students dealing with depression and anxiety. That is an exact heading of a news article and the ABC News website here in Australia on the 27th of November last year 2017. I’m Jason Hopkinson for Student Success tutor. That article concerned me. It still concerns me and it’s now January 2018 and that article School Principals were pointing out things like: Up to 30% of their students are dealing with some form of mental stress or mental health concern, depression, anxiety, bullying. Exams Stress, the fact that they have to get everything perfect first time is weighing heavy on student’s and they’re NOT doing well. For a School Principal to say that the education is system is reaching Crisis Point is saying something!! So what do you do about it? Is your son or daughter one of those 30%? Do you know if they are being bullied? Are they stressed about exams? Do they know how to enter the ‘Learning State’? When I take a student through the core study skills module, which is about eight sessions long, they will learn how to deal with exam stress and exam strategy. How to enter what I call, and speak about frequently, the Learning State that puts you into a whole-brain learning where it’s easy, fast, efficient for the information to go in, for the information to be processed, and for good answers to be formulated and for you to get the information out in an exam. When you know your subject material it’s very hard to be anxious about it, so does your son or daughter know how to study properly? Do they have a study routine? And actually get the study done?! By using the appropriate note taking techniques and the other things that can help, so when they’re in the class, they’re making the most of that time which will cut back on how much study they need to do outside of school. There are many things that can help a student do well at school. and… What’s even more important than that, is that it becomes how they live their life. So how a student behaves and operates in an educational situation is then taken out to paid employment or self-employment. With self-employment motivation, initiative, giving things a go, stuffing up and learning from it is even more important. So that’s what I teach / tutor here. I teach those skills I teach students to learn how it is they tick (operate). How to use their brain for learning. How to be creative with all of that. So that’s what I teach / tutor there in the eight core sessions there at the start [of tutoring]. I then nurture that so it becomes behavioural in FULLY ingrained with ongoing coaching after. Also in that ABC news article(1) they mentioned bullying. Now that’s a pretty narly / nasty topic, I’ll do a separate video on that. So feel free to look through the website or the Facebook page and make contact if you think I can help and we’ll discuss how I can help you or your son or daughter. If it is off line: a copy can be found here in this website as its too important not to see it. Got a question? Arrange a free call. I'll call you.